> High Performance - converting analog signal into digital signal from devices with VGA interface (desktop/laptop/HD TV-Box, etc) to devices with HDMI interface (monitor, HDTV, projector) in 6.75Gbps transmission rate, irreversible. > Support 12bit per channel (36bit all channel) deep color Support uncompressed 2 channel audio such as LPCM, and 225MHz/2.25Gbps per channel (6.75Gbps all channel) bandwidth. 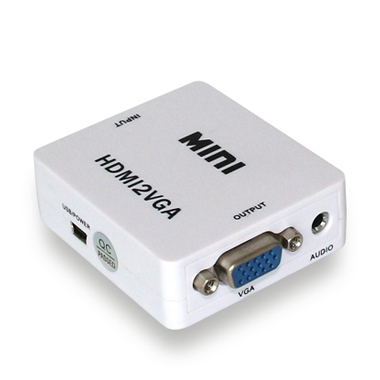 > Wide Compatibility - Most output devices with VGA ports such as desktop/laptop/HD TV box and most input devices with HDMI port such as monitors/HDTV/projector.Powered by USB power cable, the converter is compatible with more devices than those without external power. > Easy to Use - Plug and play without installing any drivers.